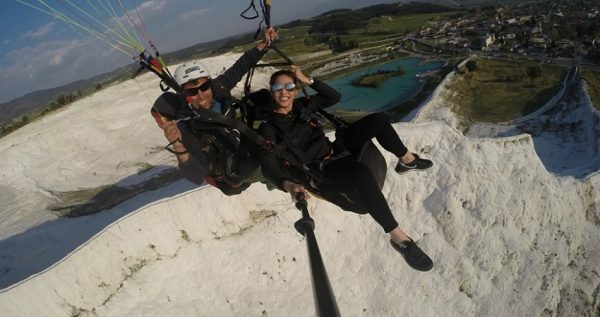 Make your holidays unforgettable by participating in Pamukkale Paragliding Tour. Enjoy a flight over the stunning and infamous White Mountain in Pamukkale and observe spectacular views over the area’s attractions. Tandem Paragliding in Pamukkale is an ideal alternative experience for those who wish to feel some adrenaline boosts. It can also be the perfect way to explore the attractions from above and appreciate the beauty of the natural scenery. Pamukkale Paragliding Tour starts by the time you leave your hotel. A comfortable and fully air conditioned vehicle will pick you up from your hotel, at a scheduled time. The car will drive you towards the point where your flight starts. Your experience starts from Dynamite Hill which is also known as Dinamit Tepe. This spot is situated 300m above the ground level and forms the ideal place for such activity. Once you arrive there, you will have the chance to meet the professional pilots and instructors. The pilots are well trained and experienced and they are ready to assist you during your flight as you will be accompanied by one of them. After the meet and greed session, a detailed introduction takes place regarding the flight. The professional pilots will explain everything you need to know about the flight. More precisely, the pilots will let you know what you can and what you cannot do during the flight. In addition, they will demonstrate the basic safety procedures and how to properly use the safety equipment. Therefore, if this is your first paragliding experience, there is nothing to worry about as the instructors will explain everything you need to know. Once the training is over and you are ready, the real experience starts! Accompanied by an instructor you will be start running for a few steps and at a point you will find yourself up in the air gliding. By that time you will be feeling free and full of excitement and adrenaline. The flight has an approximate duration of 15 to 30 minutes. It has to be noted that the flight duration is subject to the weather conditions and the wind intensity of each day. During your time on the air you will be feeling like flying. Free minded and worry less you will get the chance to observe and admire some stunning and breath-taking views over Pamukkale’s most famous attractions. More specifically, you will be able to enjoy the White Travertines of Pamukkale which are also known as the Cotton Castle. In fact, this location is a white washed mountain that forms some patios at its edges. Within the patios there are thermal springs which are known for their therapeutic benefits. In addition, you will be able to enjoy views over the ancient city of Hierapolis. This ancient city was established as a curing centre during the Roman period due to the thermal springs that can be founded there. Sooner or later, the people realized that the waters of the area had many therapeutic effects and the city became a therapeutic and spiritual place of that period. Today, people can observe the ruins of the city and the establishments that it has. 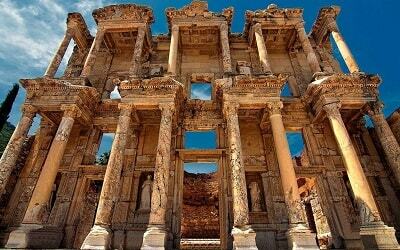 During your flight you can also observe the ancient Roman theatre that the ancient city of Hierapolis has and the Necropolis. Finally, you will be flying over the infamous Pool of Cleopatra. This pool is also famous for its therapeutic benefits and many visitors enjoy swimming there in the thermal waters. 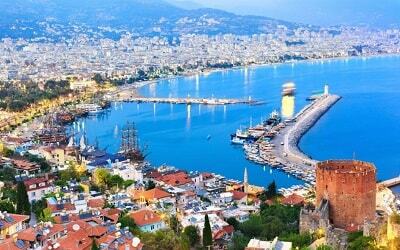 After observing these magnificent attractions from above, you will start gradually descending. Landing will take place at an area close to the village of Pamukkale. There, professional instructors will be waiting for you in order to assist you during landing and ensure that you enjoyed an amazing experience. By the moment you land, you will be full of excitement, joy and you will be feeling proud for your achievement. It is important to mention that, participants are not allowed to carry with them cameras during the flight due to safety reasons. However, the professional pilots will be snapping some cool photos and videos of your flight. After the landing process, you will have the chance to preview these photos and videos. If you wish you can purchase them at an extra cost in order to remember this experience forever as every flight DVD consist of more than 80 photos and videos. When your adventure finishes, members of our team will be waiting for you in order to transfer you back. With a comfortable vehicle you will be transferred back to your hotel in Pamukkale or Karahayit. By the moment you arrive back to your hotel, you will be full of memories and excitement. 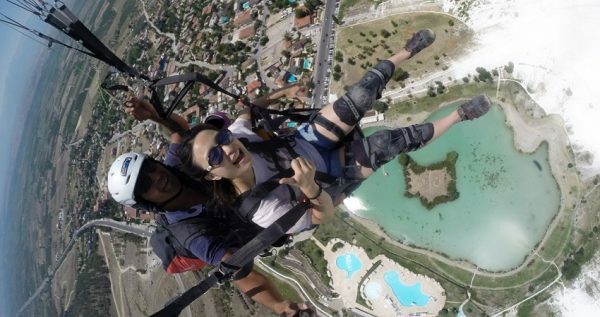 The Pamukkale Paragliding will make you feel free and alive due to the adrenaline boosts. This excursion will surely be a memorable experience from your holidays. Pick up or Drop back services from Denizli are extra, you can purchase one way or both ways transfers within payment page. Your guests are also welcome to the peak. 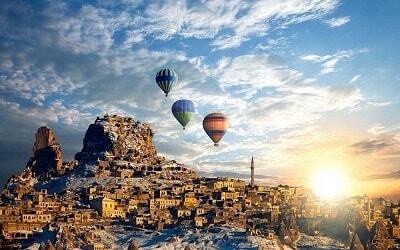 Pamukkale Hot Air Balloon is a must to do while you are in Pamukkale. Are you looking for an alternative way to explore Pamukkale’s major sights? Pamukkale Paragliding Tour is the ideal way to get away from the crowds and enjoy a truly memorable experience. 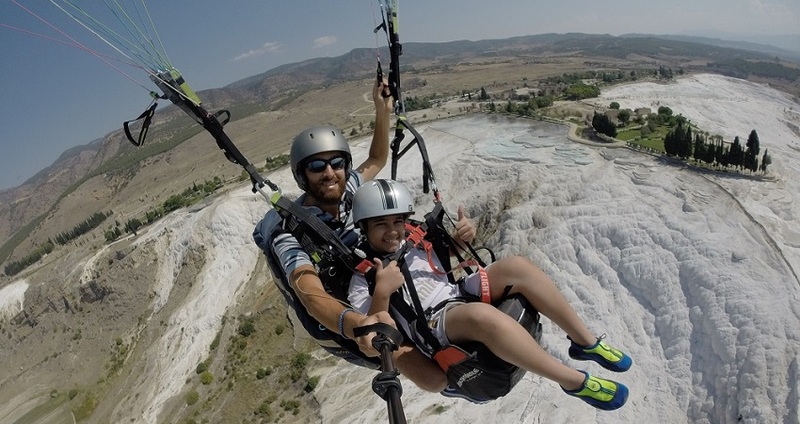 Fly above the Cotton Mountain, observe the ancient city of Hierapolis and admire the scenery from above. Paragliding in Pamukkale is ideal for those who seek to feel some adrenaline boosts and for those who wish to participate in an alternative adventure. Are you looking for an alternative way to explore Pamukkale’s major sights? 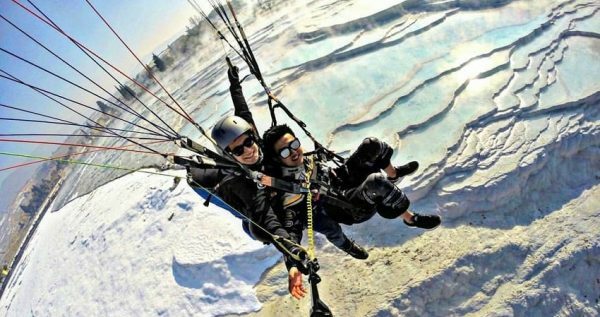 Pamukkale Paragliding Tour is the ideal way to get away from the crowds and enjoy a truly memorable experience. 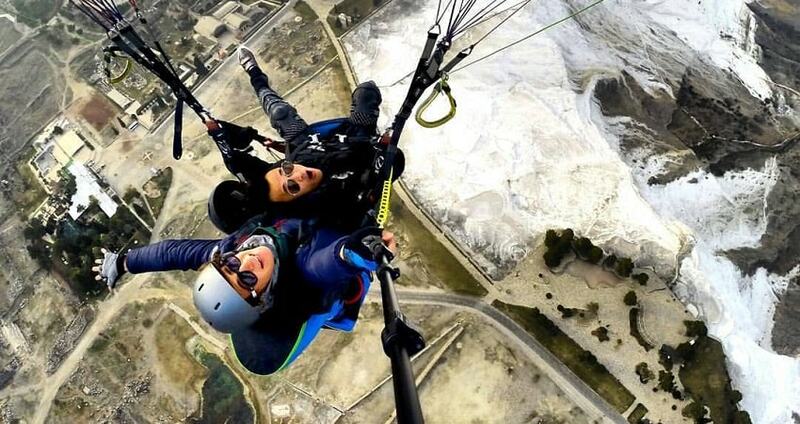 Flight above the Cotton Mountain, observe the ancient city of Hierapolis and admire the scenery from above. The excursion is ideal for those who seek to feel some adrenaline boosts and for those who wish to participate in an alternative adventure. 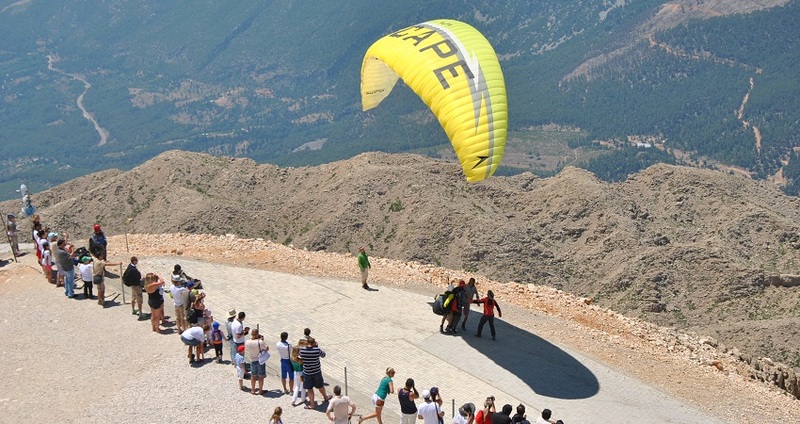 The Pamukkale Paragliding experience starts by the moment you leave your hotel. A comfortable and modern vehicle will pick you up, depending on the time of your excursion and drive you towards the starting point of your flight. 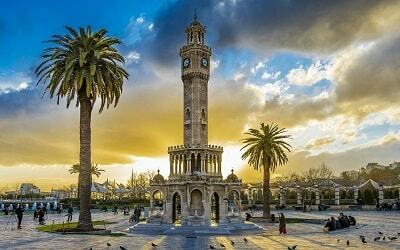 There are also pickup options for Denizli hotels, bus station or the airport. This tour is conducted by professional, experienced and fully licensed pilots. Once you arrive there, you will get to know the pilots and discuss with them anything that you want to know about the flight. It is important to note that, during your flight you will be accompanied by one professional pilot who will be in charge to ensure that you are having a pleasurable and joyful experience. This adventurous and alternative exploration of Pamukkale starts from the Dynamite Hill. The location is also known as Dynamite Tepee and is situated 300 meters above the ground level. Due to its altitude this location forms the ideal place for such activity. Before the flight, the experience pilots and instructors will provide a detailed description of the flight. They will explain what you can and what you cannot do during the flight. Moreover, the pilots will explain all the safety procedures and will demonstrate how to properly use the safety equipment. Therefore, if this is your first experience in such activity, there is nothing to worry about as the professional instructors will properly explain every single detail regarding your flight. Once everything is explained, your exciting adventure starts! Accompanied by a professional pilot, you will starts running for a short distance and after few steps you will find yourself up on the air flying. By the moment you leave the ground you will be feeling free and excited. The flight’s duration varies as it is subject to the wind and the weather conditions. In general, the flight can have an approximate duration of 15 to 30 minutes. During the flight you will be experiencing high levels of adrenaline and positive feelings. In addition, during your flight you will have the chance to enjoy some spectacular panoramic views over the major attractions of Pamukkale. More precisely, you will be flying over the infamous attraction of Cotton Castle. This location is a white washed mountain that forms small patios at its edges. Within the patios, thermal waters flow and make the scenery truly spectacular. The thermal waters of Pamukkale’s Cotton Castle are known and famous for their therapeutic benefits and many people are visiting the castle in order to enjoy swimming. The flight provides also some stunning views over the ancient city of Hierapolis. This Roman city was an established and famous spiritual and curing center during antiquity. This is because it has thermal springs and people were visiting this ancient city in order to cure themselves. Among the ruins, during your flight, you can also observe the infamous ancient Roman Theater and the Necropolis of Hierapolis. Finally, during your flight you will be able to enjoy views over the Pool of Cleopatra. The location features a natural pool that has thermal waters and is known for its therapeutic effects. The flight experience is truly unique as it combines adventure, excitement and sightseeing all in one. After spending some time on the air, you will start to descent gradually. By that moment you will be full of positive emotions and new images. In addition, you will be proud for participating in this unique experience. Landing is scheduled to take place at a location close to the village of Pamukkale. There, a professional instructor will be waiting for you in order to assist you during the landing process. By the moment you reach the ground you will be amazed and excited. In is important to mention that during your flight experience you are not allowed to bring with you any camera due to safety reasons. In has to be noted though that, the professional pilot will be in charge to snap some photos of you and film some videos during your flight experience. When you reach the ground, you can preview these videos and photos and if you wish you can purchase them at an extra cost. Every flight DVD includes more than 80 pictures and videos. The DVD will be a great souvenir and will make your flight experience unforgettable. After landing and picture viewing, the members of our team will be waiting there for you. A comfortable and fully air conditioned vehicle will transfer you back to Pamukkale or Karahayit. This unique and exciting excursion ends when you arrive back at your hotel. By that moment, you will be full of adrenaline, excitement and great memories. The Pamukkale Paragliding excursion will definitely be a once in a lifetime experience as it combines sightseeing with adrenaline boosts. Your holidays will never be the same after this alternative experience. It was a spectacular experience for me during my holiday in Turkey. 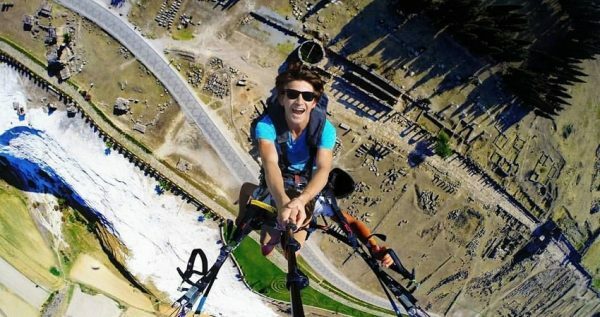 To watch Pamukkale from a bird’s eye view is just surreal and breathtaking. A very big thanks to Hassan (my pilot) for this unforgettable experience. 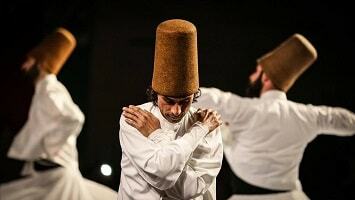 And must mention about Mr. Mehmet for the arrangement and assistance! Precious memories made in every second there. Best of the best experince of my life !!! Very helpful and accomodating staff. I can easily say that it was a very exciting activity. Highly recommended. I had an amazing flight!!! 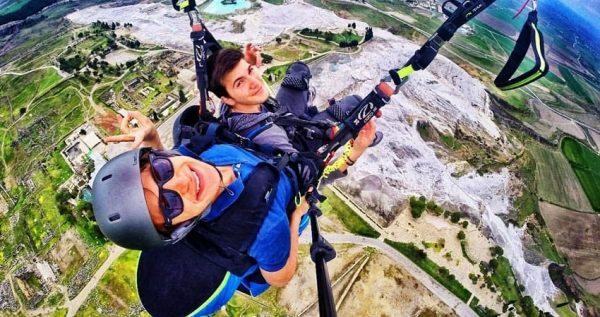 I went to Pamukkale by train at night and on the way I booked my Pamukkale Paragiliding ticket online. The pilot was very professional and funny, explain every detail to me, I felt so confident during the flight. The views of Pamukkale are so beautiful! Definitely recommended.